Like most blokes, I find it hard to resist shiny new technology, particularly when it may offer a glimpse of the future. I installed the first GPS chartplotter, bought the first iPhone and recently stood in a queue for two hours just to sit in the new BMW i8 hybrid electric sports car. You can imagine my excitement when I first heard about a hybrid boat! Unfortunately, the opportunity to personally test the Greenline 33 in 2010 did not arise, but wild horses could not have stopped me climbing on board the 33's new big sister: the Greenline 40 Hybrid. The Greenline family of cruising powerboats come out of Slovenia, right at the head of the Adriatic, bordered by Croatia and Italy. This relatively small country has a tiny coastline (only 47km), yet it is fast becoming a force to be reckoned with in the global marine industry – New Zealand-born America's Cup supremo Russell Coutts developed his personal racing fleet, the RC44-class, there. It seems Slovenia is home to some of the world's most advanced tank-testing engineers. This capability to design and produce super slippery hulls has heads turning in all sectors, from the billionaire-funded yacht-racing fraternity to the heavy industrial business-end of international sea freight. The Greenline Hybrid itself is a collaborative effort between leading Slovenian designers Jernej and Japec Jakopin, the Seaway Group and VW Marine. The product's website claims these three contributors "shared a vision for the future of boating", which resulted in the Greenline Hybrid 33. 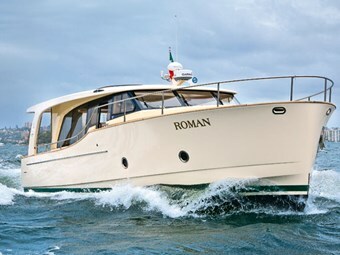 They are probably onto something as the 33 is claimed to the world's best-selling boat in the 10m class for 2010 and 2011. The Greenline 40 Hybrid is a striking vessel. Aesthetically, the designers have done a sterling job of blending a very classic look from a stylish age, with touches that clearly put this boat ahead of its time. It was hard to put my finger on exactly why I was so impressed, but with test day now a week or so in the past, it is clear this boat is intangible – something that gives it that "x-factor". 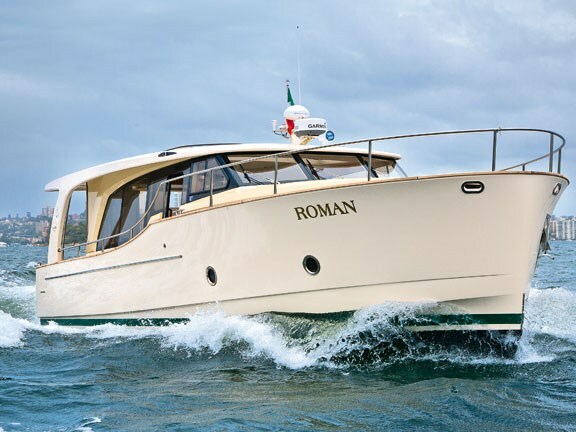 Roman has been slightly personalised by its owner, with the addition of a family crest and a few touches that give a tasteful blend of Italian style and classic elegance. Even so, the boat is still contemporary and understated – very chic. It makes you feel like an espresso with biscotti is the appropriate way to start the day. 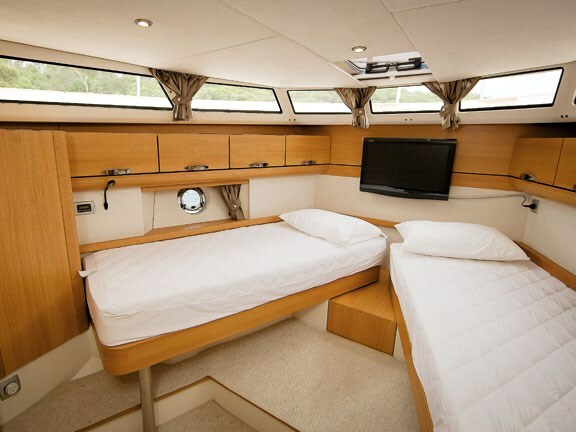 As you can see in the photos hereabouts, the configuration is refreshingly simplistic: a single-level, walk-around cruiser, with an open-plan living area. The helm station is traditionally styled and located forward and to the starboard-side, as is the norm. There are two accommodation areas and a bathroom in the bow section. 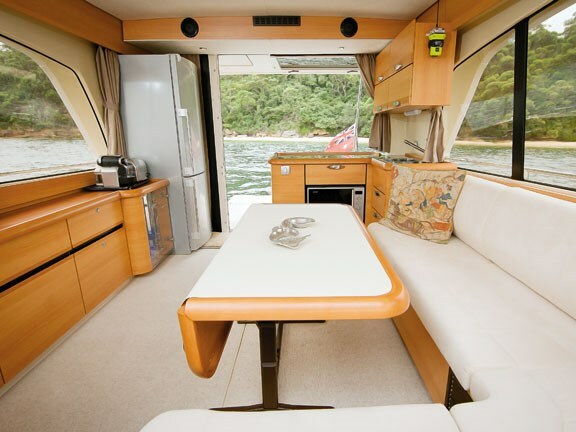 The rest of the boat is devoted to living space, with a large lounging and dining area amidships leading to a tidy aft galley. The whole back section opens up into the cockpit in a way that brings the outdoors in and vice versa, as is the trend. I had heard some concerns voiced that her compact sister ship, the 33, was small and cramped; in no way did I feel this aboard the 40, especially with the transom door lowered. Yes, there are much larger volume 40-footers, but the space here was perfectly adequate and comfortable for the six people we catered to this day. 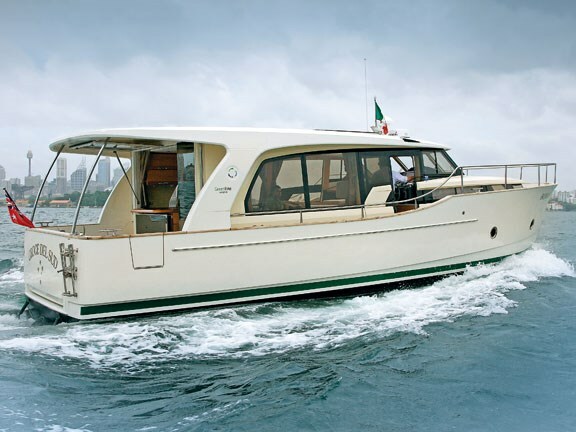 It is not a party boat, more a refined family cruiser. It's a credit to the designers that it feels larger than it is, an effect created in part by the large windows, open sunroof, light coloured decor and the open flow from the saloon into the cockpit. On the vast majority of boats we test, at least one cabin has a dedicated double berth, usually designated as the stateroom. The Greenline 40 Hybrid has no dedicated double berth. Instead, both the forward stateroom and the guest cabin have quality twin single berths, which can be pushed together to form doubles as desired. This is yet another example of clever thinking, allowing the boat's owners plenty of flexibility. It is also interesting to note the presence of only a single bathroom. One could argue that this is against the current trend, but when space is limited why bother with two heads? Instead, we see that any space not utilised to its maximum has been turned into storage, and in my opinion a boat can never have too much storage. Clutter is something most seafarers detest; there should be a place for everything and everything should be in its place. On a slight negative, as good as the some of the fittings are, not the all cabinetry work is to the highest standard I have experienced. At least some of it is veneered, rather than solid timber, but it could be argued that using such products is in keeping with the builder's environmental vision: reuse with minimal waste, rather than cut down a pristine forest in the name of pretty furniture. One feature the owner commented on, which is a valid point often overlooked, is just how easy it is to close-up and shutdown the boat at the end of a perfect cruise on the harbour. There are no clears or covers to button down, and with the development of the company's new GreenPad application for the iPad, you have one-touch shutdown at your fingertips and a remote system to monitor the boat's vitals from home. Apart from the unique styling, the obvious point of difference here is the hybrid technology. This Greenline 40 does have two conventional shaft-drive 150hp Cummins/MerCruiser (built by VW) diesel engines (the brochure also suggests there is an option to upgrade to twin 225hp power plants) and coupled to the back of each engine is a 7kW electric-drive motor, for a combined total output of 14kW. A hydraulic clutch handles the changeover from diesel to electric power. Two separate battery banks are in place. A normal lead-acid bank handles the engine-cranking duties and house power requirements, while a lithium-ion array, rated at a maximum of 24kW/h, is dedicated to the electric motor drives. For those not familiar with lithium-ion batteries, this is the same technology you find in a cell phone or laptop computer. Although it is difficult to draw exact equivalency to lead-acid due to differing performance characteristics, a lithium-ion battery is approximately seven times lighter and a third smaller than the lead-acid unit it would replace. Other advantages are that they are rated for many times the number of cycles of a lead-acid, their output remains near optimum until they are close to completely flat and their recharge time is much lower. At this time, lithium-ion batteries represent the best technology available for hybrid applications and it is only the high cost that is restricting their rollout into other applications. Clearly, a hi-tech electric boat requires plenty of charging options. In reality, the vast majority of the charging work is taken care of by shore power, but this is supplemented by a 1.3kW solar panel array. In theory, under perfect conditions, that should be enough to provide zero-cost emission-free sailing, provided you are in no hurry to get anywhere. Of course, all the battery banks receive a charge whenever the diesel motors are running. All that electric hardware is impressive but, for my 10 cents worth, the stuff that really matters is hidden under the waterline. 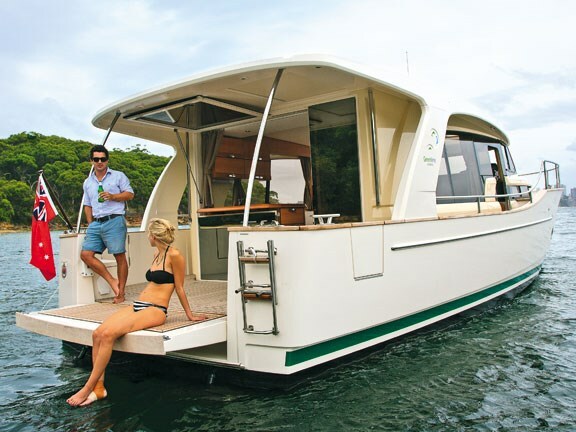 Greenline has a patent pending on what the company refers to as its Superdisplacement hull. Considerable investment has been sunk into developing these impressively efficient hulls. Terms like "computational fluid dynamics" and "velocity prediction software" are scattered through the marketing material. In layman's terms, it's all about the science of making the boat go fast without much drag, and it usually means hundreds of hours of tank testing and bucket loads of cash. In reality, as recreational powerboaters, we are the beneficiaries of money spent to produce the fastest racing yachts and the cheapest freighters. We should be grateful to whoever paid because, in all likelihood, we are looking at the future of cruising boat hulls. If you don't believe me, check out that fuel consumption data. I have to confess I wasn't too sure what to expect when I took the helm. Most of my recent boat driving has been on high-performance craft with an overabundance of horsepower, and the Greenline 40 Hybrid is not pretending to be one of those. In fact, it looks like it should be an old-style nine-knot displacement hull; the sort of boat that gets louder but no faster as you push the throttle down. Well, I am happy to say I was a long way off the mark with that assumption. With cruising speed around 17kts, she is more than quick enough for most, especially given the fuel economy, and the ride was beautifully smooth through some not insignificant tidal slop. It's the kind of delightful ride that old displacement boats of the 70s used to offer, only you're travelling at more than twice the speed on a boat that is three times as stable, with technology that makes it look like the Star Trek Enterprise in comparison. While I would not exactly call the boat nimble, with its twin screws and bow and stern thrusters, it is perfectly manageable around the dock. Rear visibility from the helm position is not ideal but it is easy enough for the skipper to control the boat standing outside, while the decky offers a few navigational pointers. With an hour's practice, there should be no nasty surprises. Finally, the time I had been waiting for was here: we were switching over to electric power. The process is simple enough: pull her out of gear, switch off the engines and switch on the electric motors. You do need to push the throttles pretty much all the way forward to get going, and with no more noise than a slight singing off the props (it's always there, you just can't hear it over the engines), you are cruising along burning no fuel, with zero emissions. It must be said that the electric-drive technology employed on the Greenline 40 Hybrid is still in its infancy, and it was good to experience the potential for myself because things will only get better from here. The Greenline Hybrid 40 comes very close to living up to the hype. The presentation is stylish and I think it would be a delightfully liveable boat on an extended cruise. In all ways, it is just easy to spend time aboard. The technology, particularly on the solar-charging side, is developing rapidly, so we can expect to see considerable improvements in the near future and I would not be surprised to see electric-drive cruising speeds of 8 to 9kts within the next five years. There is a good chance the future looks something like the Greenline 40 Hybrid, as those who wish to make a statement or even just feel better about their contribution to the environment will get plenty of value out of this boat.